Ties Rocks or Through Stone are the same thing. I'll call them ties. 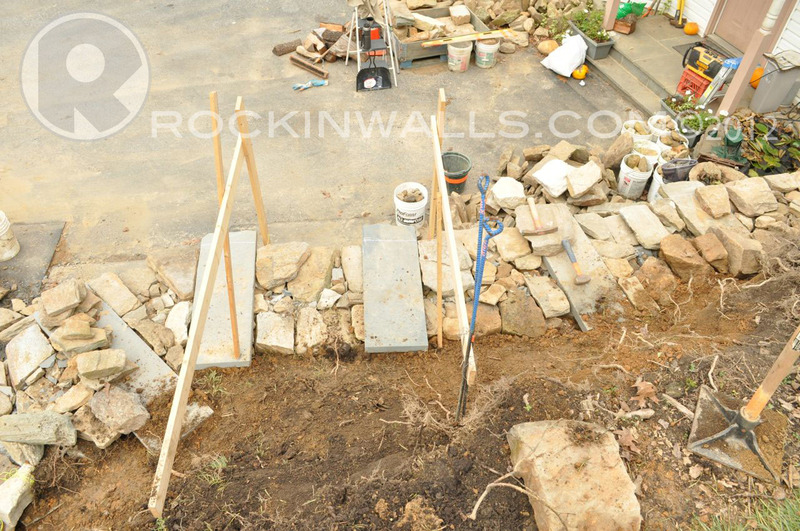 When building a freestanding walls or retaining walls it is very important to build with ties. 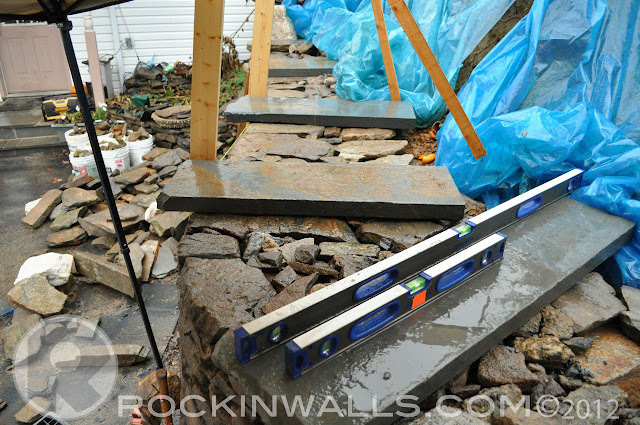 Tie stones helping make a wall structurally sound. Ties stones are used to help tie the front and back of the wall together. Over time the wall will settle along with rise with frost heaves making it a flexible system. The ties will keep the wall from bulging outward by lock it together. Illustration/spec sheet provided by the Dry Stone Conservancy USA. 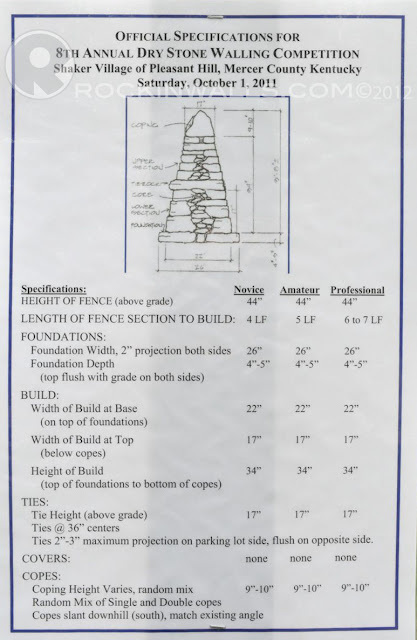 This is the specs for 2011 DSC competition of a historical wall at Shaker Village KY. Most walls at this site are 36" high with 12" of vertical coping stones. Ties are placed at 18" up - level, spaced out 36" on center, protruding on both sides 2-3". 2011 Dry Stone Conservancy DSC 8th Annual event at Shaker Village in KY. This wall section only had ties placed flush on this side but protruding on parking lot side. Set on level at 17" from grade. 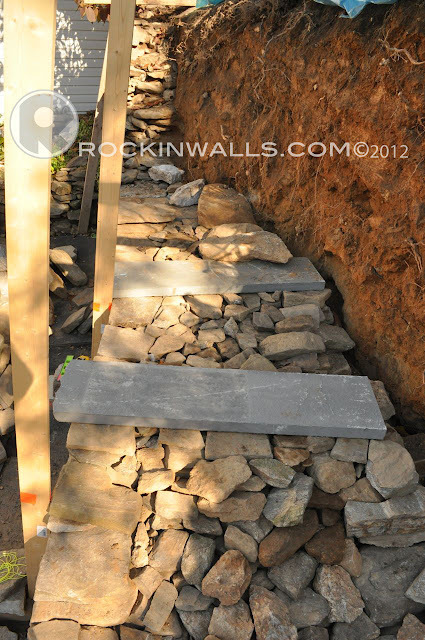 This was a the Warren Road retaining wall project at the first row of tie stones placed 36" on center. The original wall did not have them. Nor was the original wall 4' wide at the base. These ties were placed at 22" up. This wall did not have any stones to act as ties. I purchased PA Blue stone in order to add them into the wall. Not all walls will have ties. Some areas which are historical may not have used ties. Some areas do not have stone adequate as ties. Some stone may not work with ties such as rubble. Some walling styles just don't use them such as in areas of Carven district of Yorkshire*. If your working with stones you can layer and creating a double wall then you should be building with tie stones. When possible you should always use the larges stones you have for ties - of course within reason. You want to be able to lift them with at least one or two people. You should always pack underneath of them making sure every thing is tight. My ties above I used a level to help insure they were level front to back. (this day was raining so I just happen to keep both levels on this tie under the tent-no other reason to check it twice..ha ha) Make sure just like any stone you cover your joints below. If you don't happen to have tie stones long enough for the job you can use two long stones to help run past each other. But I would advise before you consider this read up more by purchasing the DRY STONE WALLING - a practical handbook. If you don't own this book and you enjoy walling or you consider yourself a professional. You should add this to your collection! A over whelming amount of content. This is the upper row of tie stones 3' long - tie back into the bank on the Warren Road Project. Notice tie stone protruding and set level. 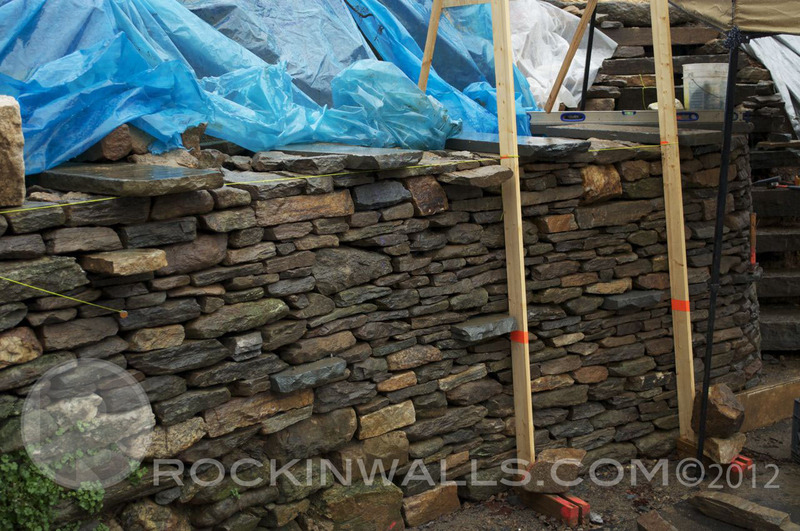 With walls over 48" it would be suggest to use additional ties set at half way points. On this wall which was 7' with flat caps I did 2 rows of ties placed at 22" up. My tie stones I used were 2" thick. 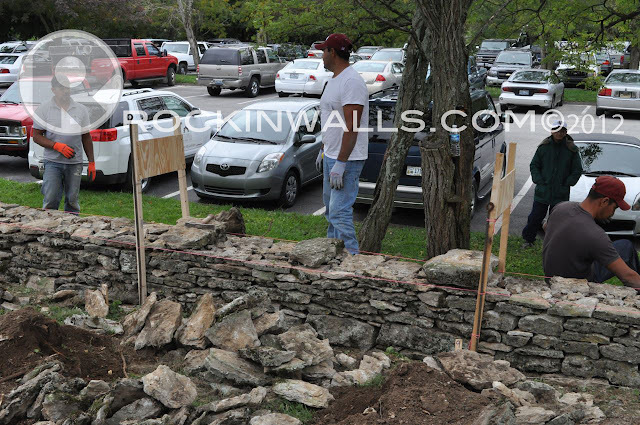 The Dry Stone Conservancy DSC suggests walls 36"- 48" tall use one row of ties half way up. 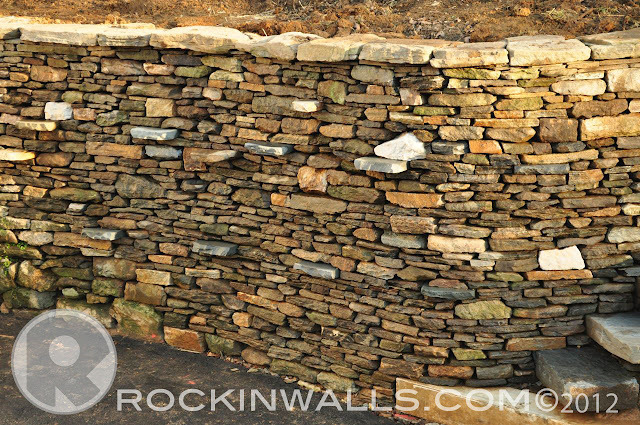 Walls 48"-60" use two rows at equal height. Walls less then this ties would not be necessary. But you could stager or place them random if you had a great deal of longer stones. This will only strengthen the wall. 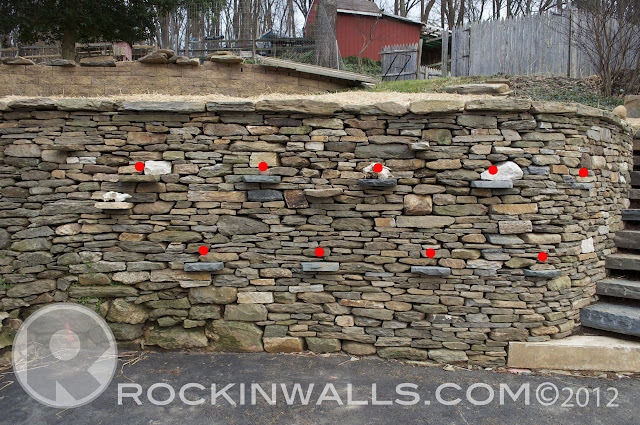 In this picture above the red dots show all the tie stones as recommended by the Dry Stone Conservancy DSC to be staggered or centered above the lower row. Tie stones are a key ingredient to make a structurally sound wall. Note: In United Kingdom not all walls use this building practice. In the USA this was very commonly found in all historic stone fences in Kentucky built by the Scottish, Irish and English immigrants. These historic walls over 100 years still stand today! Some of the walls even had ties stones which staggered through out the wall in random placement. I believe historical structures show us the value of "Sound" construction without a Civil/Engineer telling you other wise in the USA. The lack of education and awareness is alarming in the United States when it comes to dry laid stone construction or walls built without mortar. Dry Laid Stone Construction which fails is most likely due to improper building. Not following the key building rules will add to accelerated failure. *Reference : DRY STONE WALLING - a practical handbook.